Nothing beats the excitement of seeing the latest blockbuster on the big screen or the Oscar-nominated independent film that everyone is talking about! And with an IC Cinema Ticket, it's lights, camera, action all the way! You can choose from 16 independent cinemas across Ireland including Movies@ in Dublin, and fantastic movie theatres in Cork, Waterford, Wexford, Wicklow, Mayo, Sligo, Donegal and Leitrim. This voucher is for 2 adults or children in any standard 2D movie. How it Works: Use this gift voucher on AllGifts.ie to order an IC Cinema ticket for use in any participating independent cinema in Ireland. Or you can swap this voucher for any other gift or voucher listed on AllGifts.ie. IC Cinema tickets are posted out free of charge once ordered. Your IC Cinema Ticket can be used in any of the cinemas below in the Republic of Ireland. For the full list and directions, please visit http://www.iccinema.co.uk/list-of-cinemas. 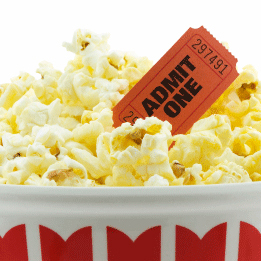 Enjoy the best films in your local cinema with the IC Cinema Ticket. Valid in 16 independent cinemas across Ireland, it's lights, camera, action all the way! IC Cinema Tickets are posted out free of charge, normally within 5 working days.